Not very long ago it looked like Luke Shaw's career was heading towards disaster. He hardly got a game in the 2017-18 season, and his contract was up the coming summer. It looked highly unlikely that Jose Mourinho would renew his contract and it looked like the English defender would have to settle for a life away from Old Trafford. Fortunately, Mourinho decided to give him a contract extension. And Shaw has certainly proved his worth under both Jose Mourinho and Ole Gunnar Solksjaer. Shaw was given a chance to impress in the first game of the 2018-19 season, and he was able to cap a wonderful performance with his first goal for Manchester United. He has gone on to make 23 appearances since then, and now looks like a leading Premier League left back. His improvement has been so drastic that many would have forgotten his torrid last season. In the 2013-14 season, Shaw was touted to be a high potential player at Southampton. He had already made 35 appearances that season for the Saints, which was very impressive for a 19-year-old. In fact, he was so impressive that he was snapped up for £30 million by Manchester United. His early days at United were marred with injuries, most notably the double leg break that he had suffered he suffered in 2015-16 which sidelined him for the rest of that season. He was not able to prove his fitness to Mourinho in the 2017-18 season and that kept him on the bench, with the Portuguese deciding to use the unorthodox Ashley Young instead. Now, the 23-year-old looks sure of himself, and has also earned several England call-ups, which is a true measure of his improvement this season. He has also put up good shifts against the likes of Mo Salah and Wilfred Zaha in games against Liverpool and Crystal Palace recently. 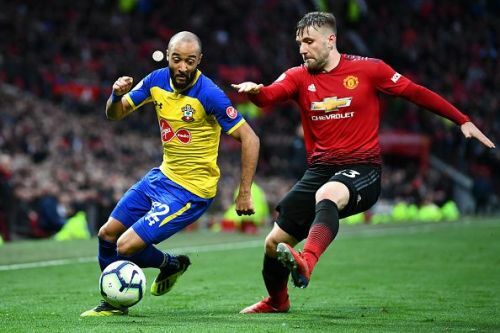 United supporters would be particularly happy with Shaw's development as he and Diogo Dalot have the potential to form a lethal full back duo for the next decade or so. Now that Shaw has sorted his career, he will be focused on bringing trophies to Old Trafford for his teammates and fans to cherish.